Oh, this looks so fabulous, and sounds great. I have been thinking about trying to make bisteeya for some time, but been a little daunted. I’m so glad you made this! Melissa – your posts are not only beautiful, but also really educational and informative! The only time I had pastilla/bisteeya was at Red Marrakesh on Nicolson Street, and it was ok. I guess I must try your sublime version next:)By the way – I saw Sam&Sam Clark making warka pastry during their cookery demonstration in Edinburgh last month, and it didn’t look too difficult at all! I just want the mint tea in the background! I share the same love for Morrocon cuisine and own tons of different Moroccon cookbooks, not to mention the tajines dishes. When you eat Morrocon, you feel you could almost feel the country around, at least in my world.Beautiful portrait and picture as always. I am once more tempted to try! hi melissa, a wonderful post as only you can write – love the picture, the very height of casablanca chic, replete with swaying palm frond 😉 i well remember my first taste of the cinnamon-fragrant pigeon pastilla at momo in london – like you’ve said, the combination is unexpected yet mind-blowing in the best possible way! I learned a lot from this post. Thanks for the recipe. Incredible, Melissa! I’ve been planning a trip to Morocco for ages, but have resigned myself to dreaming about it for a while longer…I’d love to make this, but I’m still trying to figure out how to get myself an oven in China. Your bisteeya looks absolutely delicious. Thanks! Melissa,There is a Moroccan restaurant in town that is one of my favorites. The bisteeya is prominently featured in their menu – it’s always exciting to see this huge fragrant platter headed to your table. Very lovely picture! Your bisteeya looks divinely appetizing! 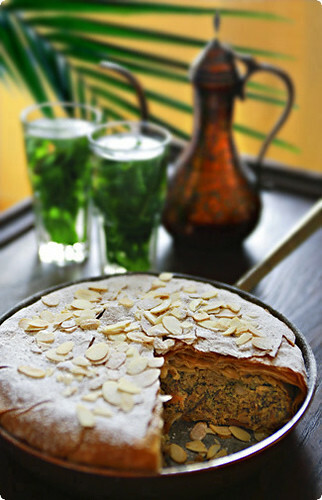 Thanks for sharing this recipe with us…I love North African food, so I’ll try this recipe soon! I am Moroccan, I would like to thank you for your tribute to Pastilla, the true Pastilla.It’s a very delicate feast dish (It was the first course for my wedding dinner) and it tears my heart when I see some heavy puffy pies called pastillas.Howewer, the seafood pastilla, which has a completely different taste, seems to be the one that moroccans prefer now. The reason is that the ingredients are more expensive and "classy" and the whole thing is lighter that the real pastilla. Moreover a seafood pastilla allows one to have another classical dish as a second course : The prune and almonds tagine.The classical second course for a classical pastilla is usually roasted lamb. (a whole lamb).Thank you again ! I have tried a recipe for B’stilla which I found in a national newspaper. It tasted very rich and very sweet and I was very disappointed!But I’m not one to give up on unusual and interesting foods so I’m happy to give it a second chance by trying your version. Unfortunately this one got a little out of hand for me. Couldn’t get it all to sit so nicely like in your picture. But even as a smushed-up mess, it still tasted wonderful. Thanks again! I followed your recipe on Sunday and the results were excellent! I’d never had bisteeya before, but I’d been craving it ever since reading this post. Thank you for the great recipe and inspiration! Interesting thing about the warka theory – the whole tossing a ball of dough on a hot surface is also how piki bread is made by Hopi indians.Wow.